I love routines. And one of my favorite routines is orally saying these letters and sounds each day. I mix up the stack, put them on the table face down, and begin calling each letter. I point to the uppercase letter and say the letter's name. I point to the lowercase letter and say the letter's name. Then, I point to the picture and say the sound two times, followed by the name of the picture. For example, I say, "A, a, /a/, /a/, apple." "B, b, /b/, /b/, ball." We say this every. single. day. At the beginning of the year, my students are mostly mimicking what I say. Later in the year, they are able to begin saying it with me. It really helps them master both letters and sounds. Obviously, right? That's what I originally designed them for! I mix them up and call the letters. Since the alphabet cards have both upper and lowercase, my students can cover either one when it is called. Who can keep the most cards? Well, you have to KNOW it to keep it! I mix up the cards and put them face down on the table. Taking turns, I show students a letter. If they know the letter and/or sound (usually depending on the time of year and their goal), they can keep the card! The student with the most cards at the end wins a sticker. If they don't know the letter, I typically tell them and hide it back in the stack. I always loved playing Zap with my older students, and I love it just as much with my little ones. With this game, I put all of my letters in a paper bag, along with two to four Zap cards. Students take turns pulling out a letter. If they know it, they can keep it. If they don't know it, they put it back in the bag. If they draw a ZAP! card, they have to put all of their cards back in the bag. I usually set a timer before we start. Then, when the timer goes off, whoever has the most cards wins the game. I like this game because we can play for two minutes, ten minutes, or twenty! It really doesn't matter. They love it! 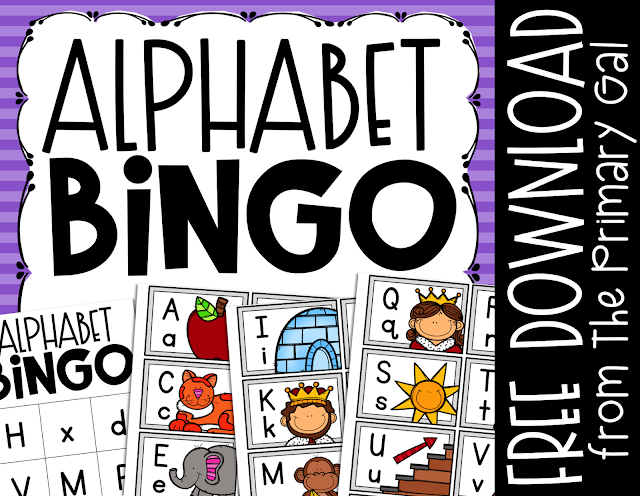 Want to download these letter cards and bingo boards? Click the image above to download them by subscribing to my email newsletter. If you are looking to assess your students on letter recognition or their ability to produce the sounds, I have just the thing you need! I have a collection of progress monitoring tools to help you assess your students and track their progress.